Guess how much we love her? hard plastic handle and frame…. Can you guess how much we love her? Please be sure to keep those grill cleaning brushes out of reach! Can you guess how much the kids loved her? Don’t we all love our pets so much? Here’s to a safe and happy summertime…for pets and people! Friday Evening: Little did I think when I created these pages and posted them on Wednesday morning that those bristles would do anything other than just pass through the system…dogs eat so much stuff and usually it’s not a problem..but this time it turned out to be. 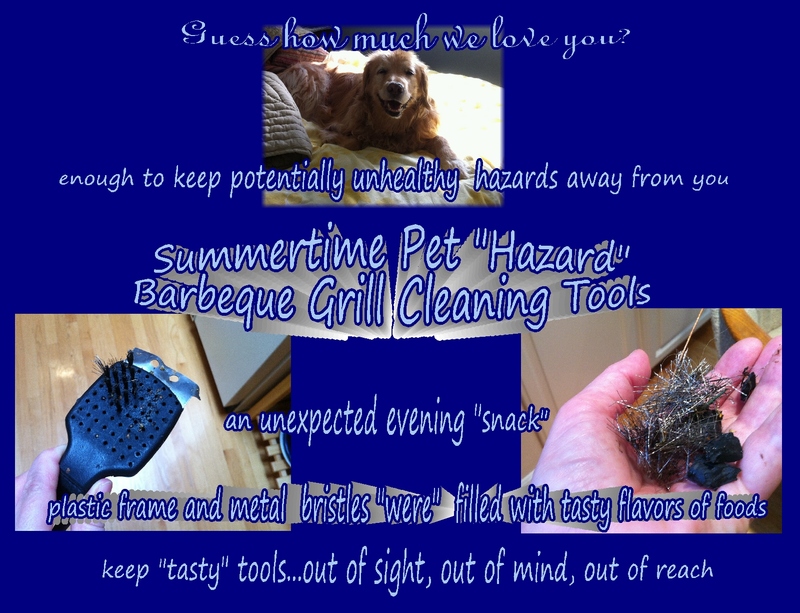 My original intention with this post was mostly to alert other pet owners to be aware of the hazards of grill cleaning brushes…little did I realize how much of a hazard they can be! Update Friday: Nali had to have 2 separate stomach operations to remove the bristles. We visited her tonight and she was happy to see us. She’ll need to stay at the emergency hospital through the weekend. 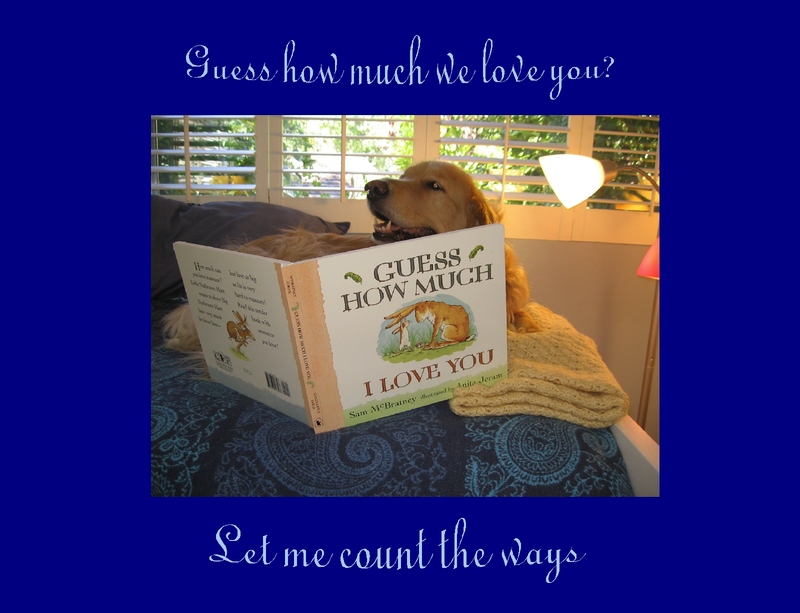 Saturday: we visited Nali before she was transferred to ICU at UCDavis Vet School Hospital… she was happy to see us and loving as can be….time will tell…please hold her in loving thoughts and hearts…thank you…kathy, peter, julie and nali…. Sunday: Nali passed away this afternoon, after too many lung complications after the 2 surgeries….we are so shocked and surprised that this has happened. This entry was posted in Life and tagged Animals, Appreciation, Awareness, Encouragement, Happiness, Inspiration, Intention, Life, Love, Loving kindness, Motivation. Bookmark the permalink. Our pets show us such unconditional love daily..ok, mine is sometimes conditional when food is involved! Ah yes… being loved “mostly” unconditionally… lucky us. Oh, fingers crossed that Nali passes the x-rays with flying colors. We don’t grill meat, but I can see that a grill brush might smell tantalizing to a pup. Thanks Nancy. She’s at the vet now… here’s hoping she’s fine. Uhoh…my daughter just called….she found out about Nali by reading this post…uh oh…I didn’t want her to worry…that backfired! Seems I need to let her know “news” before posting about it. A whole new world with electronics/blogs etc, it seems. Well, it’s nice that your daughter reads your blog . . . even if your plan to save her from worrying backfired. Hi Nancy…update on Nali’s major complications above in post and in comments to Joss…major complications, but hopefully going toward positive now…we sure hope so. Oooh, I didn’t expect these news. I just checked WordPress tonight and saw your reply. I am so sorry that you lost a best friend but glad you were there with her. My hugs to you and your husband. The photos made me smile, especially the one with the book. 🙂 Hoping Nali passes the x-ray tests! My sis who lost her son 8 years ago is in a relationship with an older man who has a dog. The dog loves sis, and she loves him. They adopted a second one which has added more love to her household. This is the first time in years that I have seen sis happy. I think she loves nurturing and taking care of her “boys.” A dog’s unconditional love (and also being in good relationship with her partner) can be healing. Isn’t that book photo precious… 😀 …. yes, the wonders of loving and being loved by dogs…really remarkable. The vets will be operating on Nali this afternoon…to remove the stuck clump of bristles and plastic in her stomach. They can’t do the less invasive endoscopic procedure, because the bristles are so sharp…so they’ll just do a “regular” operation. 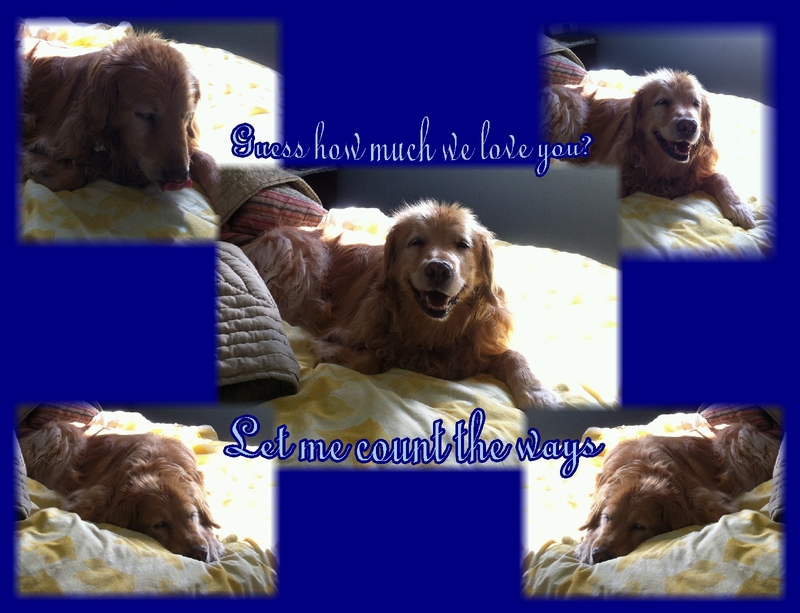 Here’s hoping all goes smoothly and well….she is such a sweet, gentle and loving friend. Oooh, sorry to hear this! Also hoping everything goes super well, and that she is back to her playful self soon. Update above in the actual post and in comments to Joss… whew…she must be exhausted and so are we…At least, she’s alive. Hopefully she’s healing now…we sure hope so. 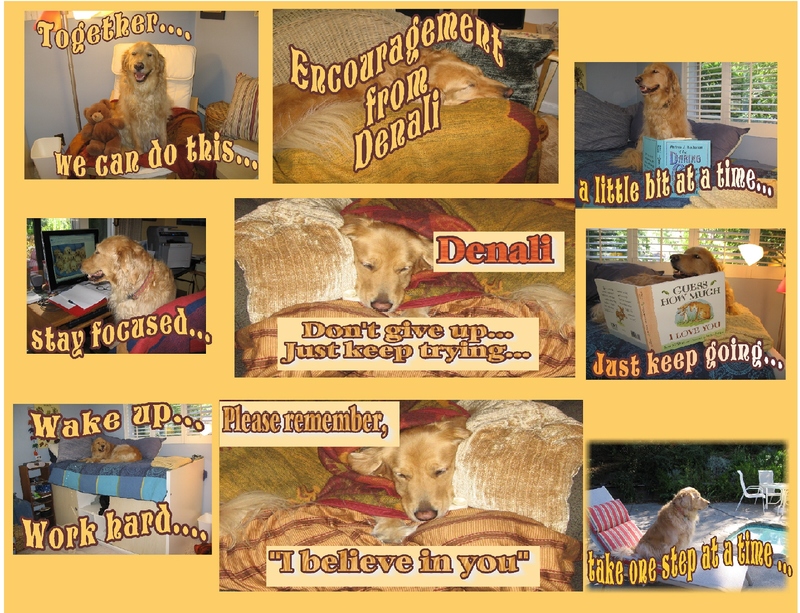 so let us know how Denali is now. She is so loved. Made me smile to see some of the cards you made for your students – that is so you – spreading positivity and encouragement everywhere. Friday 4PM: Second operation finished. They removed more bristles Goodness, what a few days these have been…worse for Nali than us, but still…kind of rough all around.. Lots of loving thoughts, energy and prayers were being sent to her by friends and loved ones. She is much loved. Let’s keep her in a blanket of golden healing till all is well. Oh that is just heartbreaking. Sending you a gentle comforting hug.